▶Measures 13.8 by 13.8 by 18.5 to 24.4 inches (LxWxH) . ▶The pre-installed wheels onto the base come with you, only one step to finish the assembly in 3 minutes. ▶Seat Material: Softly-Cushioned PU leather in Black, 3.9-inch Thick High Density Foam provides a supple surface and a comfortable place to sit. Should you have any concerns, our friendly customer support team will reply you in 24 hours. 【COMFORTABLE】-- 3.9 inch thick high density cushioned sponge seat provides firm support without sacrificing on comfort, meanwhile, 13.8-inch diameter seat offers ample seating surface. 【SEAT HEIGHT ADJUSTMENT】 -- Hydraulic gas lift makes height adjustment as simple as the pull of a lever, adjustable seat height from 18.5 to 24.4 inches. 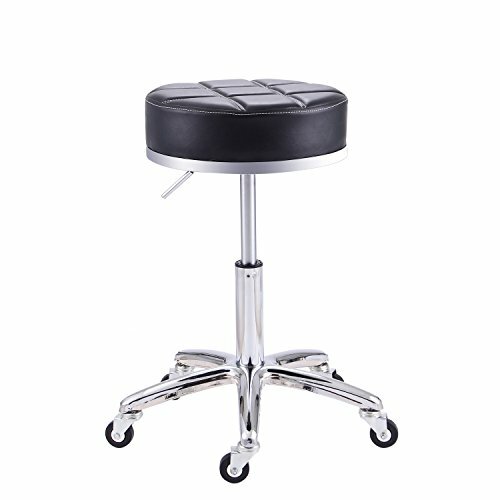 【WEIGHT CAPACITY】 -- The rolling stool with 5-caster chrome metal base is well constructed and durable, maximum weight capacity to 250 lbs. 【EASY TO MOVE】 --Offering a versatile range of motion, the stool chair swivels 360 degrees for multi-tasking convenience, while its durable casters allow for smooth-rolling mobility from one work space to another. If you have any questions about this product by Rfiver, contact us by completing and submitting the form below. If you are looking for a specif part number, please include it with your message.